Free admission! Line may begin forming at 4AM! 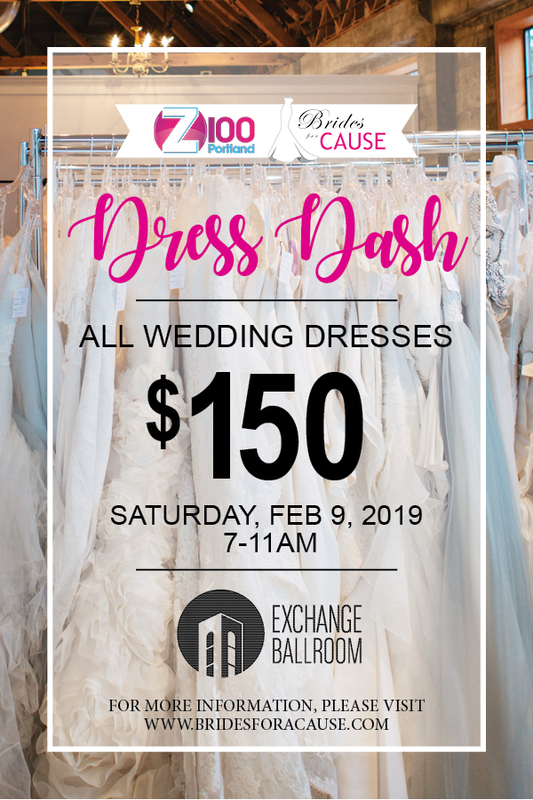 Brides for a Cause and Z100 are hosting its 6th annual DRESS DASH on Saturday, February 9, 2019 from 7AM-11AM at the Exchange Ballroom in Portland! This discount wedding dress event will feature more than 500 wedding dresses – all priced at just $150! How early will you show up? Looking for a designer wedding dress? Please keep in mind, this is a clearance event to help “clear our racks.” We also have a permanent bridal store in Portland, Tacoma and Seattle, which “houses” all of our inventory, including designer and new arrivals. Learn more about our Portland Boutique, Tacoma Boutique or Seattle Boutique! All wedding dresses only $150! Dresses available in sizes 0-24! Discounted veils and slips available! Take your dress home that day! Free parking is available on the west side of the building (behind the building), in the parking lot off of 2nd Avenue. From 3rd Avenue, take the ramp down to the parking lot. Look for “Event Parking” signs! The line will start forming in front of the Ballroom on 3rd Avenue, so once you’re in the parking lot, walk around to 3rd Ave. Street parking is also available. No registration is required, but tell us you’re coming by filling out the form on our Events page! Spotted Stills styled shoot featuring Trish Lee dress! Our Portland boutique is hiring! © Brides for a Cause. All Rights Reserved.